Put the cereal into a large pitcher & crush with your hands to the texture of coarse sand. Pour in the milk & stir vigorously. Let steep for 20 minutes at room temperature. Strain the mixture through a fine-mesh sieve, collecting the milk in a medium bowl. The milk will drain off quickly at first, then become thicker and starchy toward the end of the straining process. Using the back of a spoon, wring the milk out of the cereal, but do not force the mushy stuff through the sieve. Whisk in the brown sugar & salt into the milk until fully dissolved. Store in a clean pitcher or glass jar, refrigerated, for up to 1 week. Bloom the gelatin: Sprinkle the gelatin evenly onto the surface of cold water in a small dish. Allow the soften for 3-5 minutes, then gently squeeze the bloomed gelatin to remove any exces water. Place the gelatin in a medium mixing bowl. 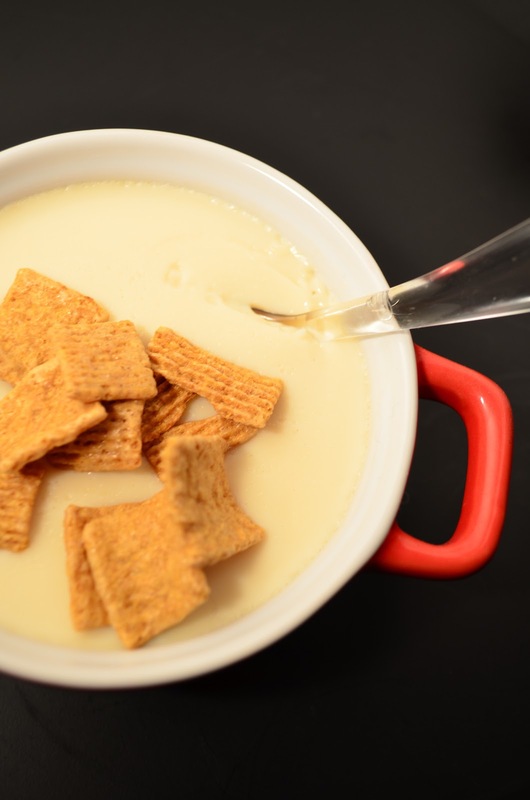 Warm a little bit of cereal milk and whisk it into the gelatin to dissolve. Whisk in the remaining milk, brown sugar, and salt until dissolved. Pour the mixture into four small serving dishes or glasses. Chill in the refrigerator until set, at least 3 hours (or overnight).